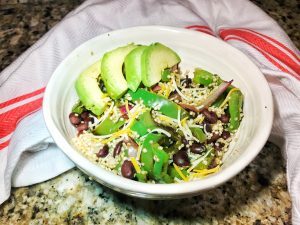 Mexican Quinoa Bowl + Recipe Roundup 6 – Be Healthy! I LOVE Black Bean Tacos and they are a staple in our apartment for quick dinners. So, I decided to take break down my tacos and make a Mexican themed lunch for the final installation of my meatless meals during Lent. Instead of using the tortillas for my carb, I used quinoa, which adds to the protein content in this yummy meal! This meal is super easy to make and throw together to re-heat the next day for lunch. Plus it’s full of protein AND fiber, to help keep you satisfied until that afternoon snack. WAHOO! While quinoa is cooking, heat olive oil spray on medium pan. Add red onion, green peppers, garlic and onion powder and sauté for 5 minutes or until onions are translucent. Add cooked quinoa, black beans, peppers and onions to bowl. Don’t forget to keep reading for some DELICIOUS, meatless, recipes from my amazing dietitian colleagues! Katie, of One Hungry Bunny, shared her 3-Step Mediterranean Style Buddha Bowl. She explains how to make your own delicious Buddha Bowl and even gives you tips on how to use the ingredients in her recipe for other meals during the week! Lindsey, of Tasty Balance Nutrition, shared her Curried Chickpea, Sweet Potato, Tofu and Veggie Bowl with Tahini Sauce. 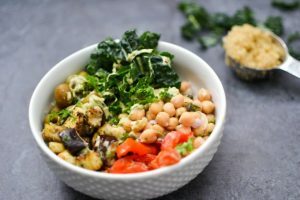 She eats plant powered bowls all the time and shares her formula on how to create your own, easily, and with yummy ingredients! 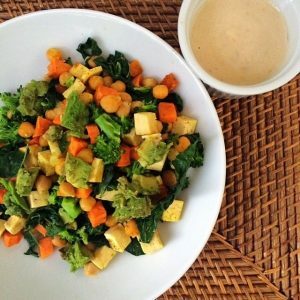 This Curried Chickpea, Sweet Potato, Tofu and Veggie Bowl with Tahini Sauce is a staple she brings to work and quickly heats up in the microwave! 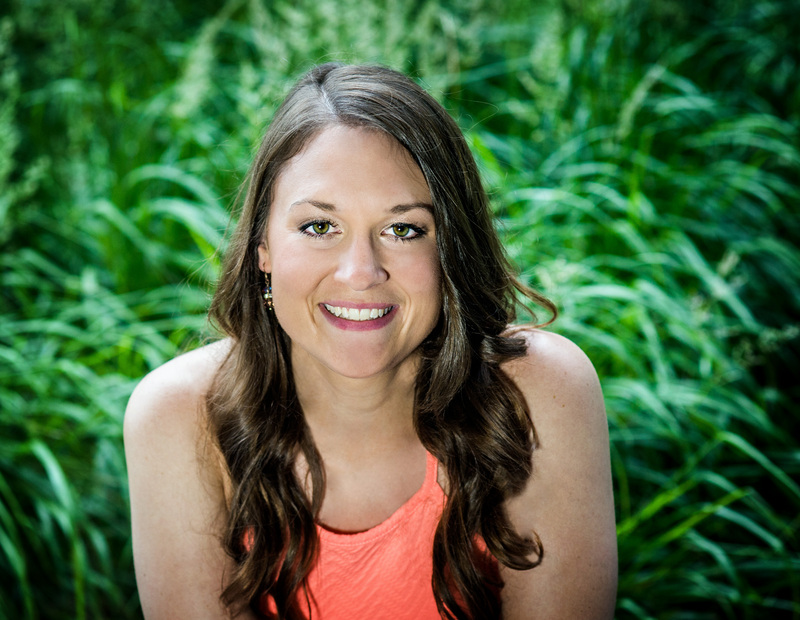 Kelli, of Hungry Hobby, shared her Spicy Tuna Salad, Salmon Hummus Wrap and Chop Chop Salad. 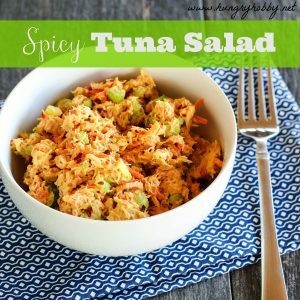 Her tuna salad is an easy, protein packed lunch can be made in 5 minutes and is delicious with toast, whole grain crackers or veggies! 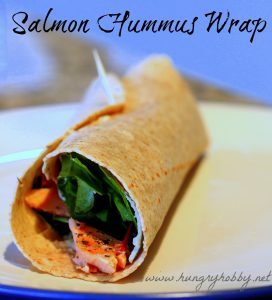 For her salmon wrap recipe, Kelli tells you how to cook salmon so it’s nice and juicy and gives you step by step instructions on how to assemble this delicious wrap! 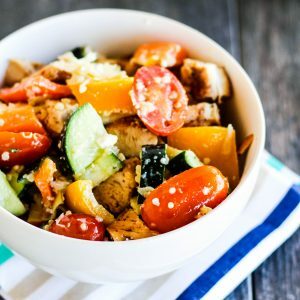 Her Chop Chop Salad is yummy, takes minimal time to prep, lasts for multiple meals and it’s as crunchy on day three as it was on day one! 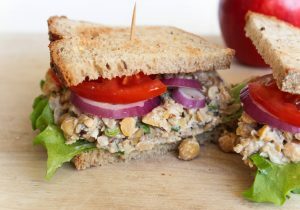 Julie, of RDelicious Kitchen, shard her Chickpea Walnut Sandwich. Her protein packed mixture can be eaten on your favorite whole wheat bread, added to your fave salad or eaten with some delicious whole grain crackers. Chelsey, of C It Nutritionally, shared her Mung Bean Lentil Salad. 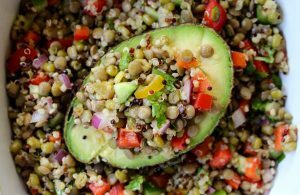 It’s full of veggies and protein and if you haven’t tried lentils or mung beans, this is the salad for you! YUM!